An Heirloom grown since the 1600s. The multi-petaled flowers come in blue, mauve, pale pink, rose, purple and white and are nestled in a ring of fine lacy foliage. 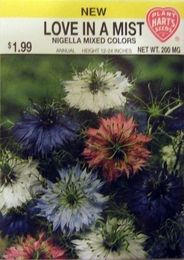 This foliage gives rise to the other common name for Nigella, ÔFennel FlowerÕ. Makes an interesting cut flower. The balloom shaped seed pods with green and purple stripes are used in dried arrangments. Plants will self-seed if pods are left on. Thinning - when plants are 2 inches tall thin to 6 inches apart.